We went to support the wedding ceremony at Kamigamo Shrine and the reception at Kyo-Ryori SAKURAI on April 23rd(Saturday). The bride and groom were arranging the weddding at LST Tokyo Salon. 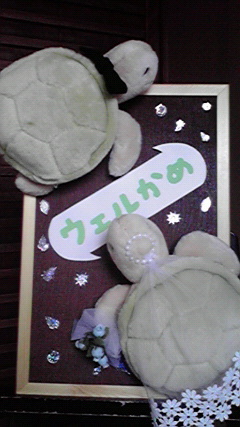 The first thing that has greeted the guests was 『ウェルカメ（Wel-kame)』welcome board made by the bride!! There were many hand-made items, such as ring pillow, and songs, that the reception was always filled with smiles and laughter. We are glad to have a relationship with the bride and groom, and that we could support their important day.